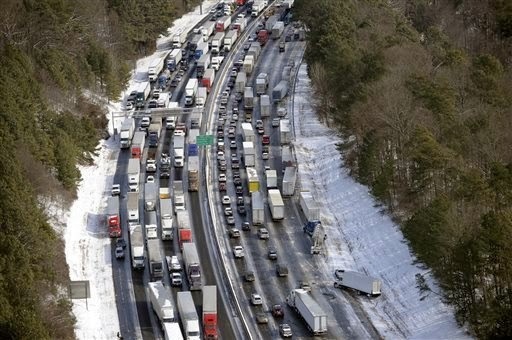 The lead story in the south is the gridlock in Atlanta and Birmingham caused by a sudden burst of snow. The whole thing was strange in that it didn’t look like much. We’ve had worse. It was nothing more than a dusting compared to some snows we have had in the past, but it has caused havoc. As a result there have been a myriad of human interest stories as people slept in their cars on the interstate, enduring single digit temps. Moms and dads walked miles to schools to be with their children who were trapped in the building for the night. There was even a baby born on I-285. Apparently something decent and kind can come from 285. I want you to know, that what has happened to me has really ____________________________. No curse words please . . .
Paul’s imprisonment – serves to advance the gospel. Paul’s rivals speaking ill of him wanting to add salt and shame to his wounds – serves to advance the gospel. Paul’s life – serves to advance the gospel. The prospects of Paul’s death – serves to advance the gospel. Paul’s letter – serves to advance the gospel. If Paul is released – you guessed it – it will serve to advance the gospel. His thinking ought to deeply challenge our thinking. It should especially challenge those of us who claim to follow Christ, who, like me, often think of inconvenience and suffering only as a bother. The centrality of the gospel for Paul calls for me to rethink a lot of things in my life. Paul challenges the way I think about the gospel itself. If I am honest I would say that in most cases I treat the gospel as secondary, unimportant, and as a result there is a marked lack of urgency in my life. The gospel of Jesus Christ is everything to everything. Paul challenges the way I over-dramatize most everything and as a result have no real grasp of what it means to suffer. Paul challenges my attitude in interruptions and inconvenience (Phil. 1:14). Think of how many parables Jesus shared and miracles he did on the occasion of interruption. Think of how many people inconvenience has led me to and how few of them I have shared Christ with. Paul challenges the way I talk about other churches, pastors, or servants of Christ who are not like me. Do I speak as a rival out of envy and conceit or is it from love “knowing that I am put here for the defense of the gospel (Phil. 1:16). Paul challenges my dependence on prayer and the Spirit of God (Phil. 1:19). Paul challenges my definition of life (Phil. 1:21-22). Paul challenges my understanding of death (Phil. 1:21-22). Paul challenges the way I think of myself and my connection with the other people in the church. It is not, who are they for me, but rather who am I for them (Phil. 1:24)? Paul challenges the way I evaluate difficulty. Most of the time it is without reference to the gospel, but according to his remarks, difficulty is a necessary assistant to help my Christian experience (Phil. 1:25-26). Posted in Philippians and tagged featured.